Photo Friday: Thistle, Friend or Foe? Friend or Foe? I never considered this pesky plant as a friend, but the top google results all returned “milk thistle” as a herbal remedy for liver and gall bladder ailments. But another type of thistle is “bull thistle.” The desciption of this plant is more in line with my thoughts: NOXIOUS WEED. However, the bloom in this photo matches neither’s descriptions. Maybe someone more informed in plant nomenclature can give some assistance? Which ever this plant may be, thistles are pesky plants. These weeds thrive in open, sunny areas, encroaching on open pastures and hay meadows. The thistle blooms in mid- to late-Spring, spreading its seeds across large areas. 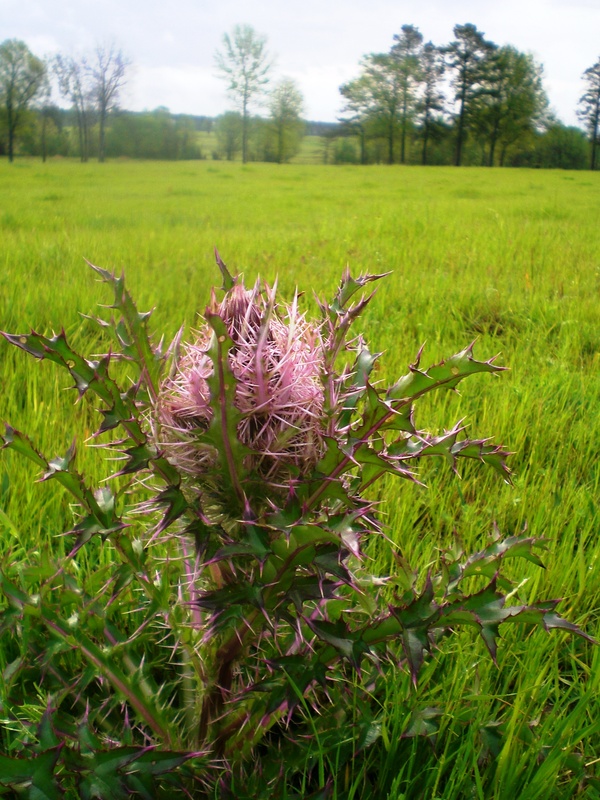 Overgrazing of pastures, road sides, and cleared timber patches make prime growing areas for the thistle. In a dense stand, these plants can reduce productivity and stocking levels of pastures. I have seen many methods of controling these plants over the years. Spot spraying chemicals (glyphosate, triclopyr or metsulfuron) tends to be effective but takes labor. I have even seen people chop the plant at ground level with a shovel and cover the plant base with feed salt. Works well till the cows come and lick up all of the salt. Too bad the cattle don’t eat these plants, because they’d sure have some good grazing. Lets hope I never find thistles this tall in my pastures! Have you had trouble with thistles of any kind? What methods of control have you found successful? Uhmmmm Not sure how kosher this is, but I ran around and put drips of tordon (the stuff we also use on unwanted trees) on the thistles in our yard, especially the side that butts up to one of our pastures. They are starting to look pretty sick while the grass still looks happy! The thistle seed is a big draw for golden finches and the like. The seeds in the store are supposed to be sterile???? We have always called it bull thistle here. Looks the same as your photo, but I don’t know for sure. They shoot up over night and next day from a distance in pasture you keep wondering what it is. When you get half way there you realize it’s a dam thistle and turn around. We were at a Cattlemen’s meeting last night with a DuPont representative talked about controlling the “Musk thistle”. Their Cimarron Max is a very good product to use on pastures and does kill the seeds after they’ve bloomed out. It’s called a noxious weed and as a producer you should be expected to get rid of it because as a neighbor I sure don’t want the seeds blown over on me! Musk thistle… the one I missed. Best control method I can recommend for musk thistle is 2,4-D and dicamba (Clarity or Banvel). On a scale of 1-10, that combination rate is a 10 for control of bull, musk and plumeless thistles. You can also use products like Crossbow and Forefront, which also include 2,4-D and another chemical that is usually either aminopyralid or triclopyr. Other methods that are effective but not to the degree of others are herbicides such as Milestone, Cimmaron, or glyphosate. To really get these weeds good though, you need to mow them off before they go into reproductive stages in late summer and then when regrowth begins, spray them with an herbicide in the fall (they are tranlocating nutrients down into their root system at this time). This way the herbicide will also be translocated down into the roots and rhizomes and kill the entire plant. Spraying in the spring only kills the aboveground portion of the plant leaving the roots and rhizomes capable of growing back.